Llewelyn Morgan’s The Buddhas of Bamiyan is the most recent installment in the Wonders of the World series edited by Mary Beard. The book mines the history and meaning of these colossal figures, which stood for 1,400 years before their destruction by the Taliban in 2001. In the post below, Morgan tells of a visit to the grave of a woman whose life story he came to know during his work on the book. Julia Mulock, née Sturt, had become a minor obsession of mine as I wrote The Buddhas of Bamiyan. Aside from her remarkable early life, Julia came to encapsulate for me Britain’s long and spasmodically intense relationship with Afghanistan, a relationship as easily forgotten as this memorial in an English country graveyard. Julia Florentia Sturt had been born in captivity in Kabul. Her mother was Alexandrina Sturt, a prisoner of the Afghans; her father, Lieut. John Sturt, was already dead. He had been an officer of Engineers in the British force occupying Kabul during the First Afghan War, a misguided attempted to establish a buffer zone between British India and the Russian Empire encroaching from the north. A series of tactical errors resulted in a chaotic British retreat in midwinter, under ferocious attack from all sides, through the mountain passes between Kabul and Jalalabad, one of the most notorious disasters in British imperial history. A measure of the horror of this massacre is that Sturt was said to have been “the only man of the whole force who received Christian burial.” Very few indeed survived it, but Sturt’s pregnant widow Alexandrina, her mother Lady Sale, and a number of other soldiers and dependents were taken into custody by Akbar Khan, leader of the Afghan resistance, and spent nine months as effective hostages while the First Afghan War lurched towards its messy conclusion. In the latter stages of their captivity, as a British “Army of Retribution” closed in on Kabul, the prisoners were moved up from Kabul to Bamiyan, high in the Hindu Kush. Conditions were grim, and they faced the awful prospect of being marched north, beyond the mountains, and sold into slavery. But they also had the opportunity to visit what a series of European visitors to Afghanistan over the previous decades had made a famous monument, the cliff face peppered with caves and containing the giant Buddha statues. Lady Sale’s journal was illustrated with “some very pretty and correct sketches” by another captive, Lieut. Vincent Eyre, including three images of the Buddha cliffs. That old lady in North Cheriton wouldn’t have remembered anything about Bamiyan, or the emotional scene when a force led by Lady Sale’s husband rescued them in September 1842. But she probably did retain some memories of the amazing reception when her family visited Britain in 1844. When they first landed at Lyme Regis (from a ship which the press were delighted to discover was called the True Briton), Lady Sale, her husband, daughter and granddaughter Julia were mobbed by well-wishers: “as soon as their presence became known,” according to The Times, “the nobility and gentry of the neighbourhood, and the inhabitants of Lyme, vied with each other in offering their congratulations, while the church bells poured forth their merriest strains of harmony…” There were similar scenes in Londonderry, Liverpool, Southampton, and London. Lady Sale was the heroine of the hour. At Astley’s Amphitheatre a circus performance culminated in “Lady Sale” fighting a double sword combat “with six Afghans, whom she put to flight.” This lionizing of Lady Sale isn’t so hard to analyze, a substitute victory that softened the dismay Britain had felt at the humiliating retreat from Kabul. At 17 Julia married a military man 25 years her senior (they consistently falsify their ages in the census, not making Julia any easier to trace). Julia’s later years were no bed of roses, following her husband on his postings around the Empire. She lost two sons who followed the family tradition into the army. But it was to all appearances a happy marriage. Certainly Julia’s final years at The Old Rectory in leafy North Cheriton (a comfortable house up the hill from the graveyard where she now lies) were as far removed as it is possible to imagine from the place and circumstances of her birth. Our book, like the exhibition, affords a greater understanding of ancient Egyptian belief systems and reveals the hopes and fears of mortal man about the world beyond death. Journey Through the Afterlife contains contributions from leading scholars and detailed catalog entries that interpret the spells and painted scenes of these ancient treasures. It’s illustrated in full color throughout, with specially commissioned photographs of these exceptional papyri and an array of contextual funerary objects—painted coffins, gilded masks, amulets, jewelry, tomb figurines, and mummy trappings. To accompany the exhibition, and as a fitting teaser for the book, the British Museum has even produced an app on the Book of the Dead, available for free from the Apple App Store. In the app you are led by Anubis, ancient Egyptian god of embalming, through the netherworld, and asked 7 questions. Answer correctly and you'll reach paradise, but get them wrong and you'll meet the Devourer, who’ll gladly eat your soul. Rest easy, though: Journey Through the Afterlife has the answers. Since 2006 the Dumbarton Oaks Research Library and Collection has been a publishing partner of Harvard University Press. The publications of Dumbarton Oaks present the scholarship in Byzantine, Garden and Landscape, and Pre-Columbian studies to which the Washington, D. C. institute is dedicated. This fall, as part of its Byzantine Collection Publications series, Dumbarton Oaks has released a revised edition of Gary Vikan’s Early Byzantine Pilgrimage Art. By day, Gary Vikan is the Director of the Walters Art Museum in Baltimore, where he stewards an internationally renowned collection and works to promote the city’s art scene. Below, he describes how his work at the Walters and his own scholarship relate. My invitation to Dumbarton Oaks came by way of a telegram to the US Embassy in Bucharest on Valentine’s Day, 1975. I was spending that academic year in Romania, under Ceausescu, with a stipend from the International Research and Exchanges Board to do research on my Byzance après Byzance dissertation topic, for Kurt Weitzmann and Princeton University. That telegram offered me a two-year contract position at DO; my job would be to research and write a catalogue of the sculpture in the collection – everything from Ptolemaic Egypt to Renaissance Germany. What luck! Not only had I always wanted to be at Dumbarton Oaks (I was turned down for a Junior Fellowship two years earlier), but also because my post-Romania job prospects were very dim. As it turned out, I would spend the next ten years of my life occupying a variety of staff positions at DO, all the while lapping up the heavy cream of Byzantium in the company of some of the most wonderful Byzantinists the world then had to offer. This was an enormous privilege for me, and I loved it. Though from the beginning, I felt a certain tension. I was born a Midwestern populist, and while I enjoyed the lunchtime conversation at DO that would typically wander from such arcane topics as Byzantine epithets for the Virgin Mary to regional etymologies for the orange (portocale, in Romanian, reflecting the fruit’s origin in Portugal), I craved connection with the real world – with things that were meaningful to those ordinary folks who walked past the brick walls of Dumbarton Oaks without a care for what was going on inside. Moreover, I was married and had a small child, and I could barely afford to pay my rent. So by night I began a second career, in adult education, with the Smithsonian Residents Associate Program. This was as close to Byzantium for the masses as I then thought was possible, and it felt right. As I taught, I sought out topics that would get my students’ attention. Imperial porphyry sculpture of the Tetrarchy was a tough sell, and for most, icons were just too abstract. But what nearly all my grownups seemed to relate to pretty easily was Byzantine pilgrimage: traveling to holy places, leaving votives behind, and taking away something sacred and powerful. What they all got especially excited about was “holy dirt,” the sanctified soil form loca sancta that pilgrims took home with them to use, when needed, to cure their ailments. When I called these pilgrim tokens the “Aspirin of the Middle Ages,” faces would light up, and I knew that I had connected. And it was this sense of connection that drew me to do a small exhibition at DO in 1982 with curators Susan Boyd and Carol Moon called Byzantine Pilgrimage Art. And with that exhibition, to write a booklet of the same title that I typed, pasted together, and drove to the printer myself. I could not then have guessed that this homemade publication would sell out, and help to nourish what was becoming a cottage industry of pilgrimage studies among Byzantinists of my generation. And I certainly could not then have dreamed that nearly three decades later the tables would be turned. I left DO for the Walters Art Museum in 1985 because I felt I needed more fully to engage with the public, through art, and because I wanted to be part of a real city, its on-going struggles and its occasional triumphs. This, for sure, was and remains the Walters, and Baltimore. So now, my day job is art and people, and my night job is scholarship, as I revisit my DO life of the ‘80s in the form of this new, expanded edition of that pilgrimage booklet. The tension is still there, though now I welcome it, since it has drawn me to two great institutions that have, each in their own way, nourished a different part of who I am. What’s next? SAINT ELVIS: From the Holy Land to Graceland – a book-length study almost completed. After all, what could be a more logical sequel to Early Byzantine Pilgrimage Art for a populist like me? When we read this LA Times story on Sarah Palin's apparent belief that humans and dinosaurs walked the earth together a mere 6,000 years ago, we wondered, despite acknowledging how patently awesome it would be to pet a dinosaur, where exactly such a belief comes from (hint: it's not from modern science). To that end, we asked our friend Ronald Numbers, who has made a calling out of tracking the origins and development of modern creationist thought, to fill us in on Young Earth creationism, where the idea came from, and whether or not, as its proponents claim, it can truly be called "science." Numbers is the author of the near-canonical The Creationists: From Scientific Creationism to Intelligent Design, released in an expanded edition last year, and is editor of the forthcoming Galileo Goes to Jail and Other Myths about Science and Religion. So, a pretty good person to ask! Below is what he had to say. According to a recent article by Stephen Braun in the Los Angeles Times (September 28, 2008), Sarah Palin, the Republican candidate for Vice President of the United States, believes that the earth was created about 6,000 years ago and that humans and dinosaurs once lived together, a belief supported, she has claimed, by evidence of human footprints inside of dinosaur tracks. A conservative Christian with strong Pentecostal and Fundamentalist leanings, Palin favors teaching creationism along with evolution. "Teach both," she once urged during her race for governor of Alaska. "You know, don’t be afraid of information. Healthy debate is so important, and it’s so valuable in our schools. I am a proponent of teaching both." I don’t much care, and I don’t think other voters should care, about the religious peculiarities of candidates for public office—so long as their views don’t impinge on public policy. It makes little difference to me whether Joe Biden, a Catholic, subscribes to the doctrines of transubstantiation or the Immaculate Conception, or whether Mitt Romney affirms the divine inspiration of the Book of Mormon, if these doctrinal idiosyncrasies remain privately held convictions. But we have every right as voters to express concern about a Pentecostal being in charge of protecting the environment (think James Watt, President Reagan’s Secretary of the Interior) who believes that we are living in the Last Days before the total destruction of that environment; or, say, a Christian Scientist, who denies the efficacy of modern medicine, being appointed Secretary of Health and Human Services. In such instances, examining the religious beliefs of political candidates is not bigotry. BLDGBLOG has posted Part 2 of the interview with Mary Beard, editor of the Wonders of the World series and author of the forthcoming The Roman Triumph. Also, don't miss Mary's Times Online blog "A Don's Life." 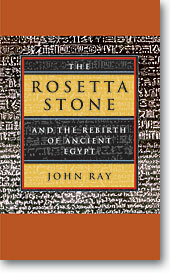 In Sunday's Washington Post Book Review, Jonathon Keats reminds us of what the Rosetta Stone meant to the generation that discovered it while reviewing John Ray's new HUP book on the subject, The Rosetta Stone and the Rebirth of Ancient Egypt. The Washington Post has a new article up in their Jamestown series--this one about archaeologists' unearthing of the settlement's long-lost fort.